Flip This Switch? Game On! Leave It Off? Game Over. Many variations of those words have been uttered by scholars, scientists, and sages throughout the ages. Think big. Get big results. Think small. Get small results. Oh, I know … I know … I can hear some folks saying it already. 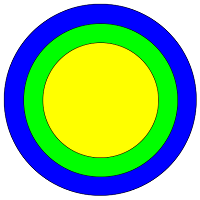 Let’s put it another way … Imagine your potential is the green circle. If your thinking is as small as the yellow circle, you’ll never reach your potential. If your thinking is as big as the blue circle, maybe you’ll miss – but at least you’ll reach your full potential. And maybe … just maybe … you’ll surprise yourself to discover your “potential” is way beyond anything I can diagram here. Either way … Think big! It’s an essential switch you need to flip. If you don’t, it’s like handcuffing yourself and forgetting you hold the key. So, how does one think big? 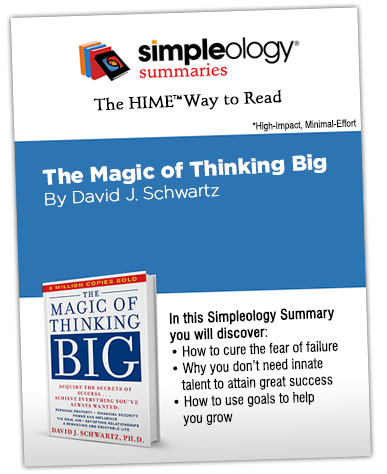 The Magic of Thinking Big is the go-to book on the subject. It’s an essential read. But you don’t have the time to read the whole book. Simpleology Summaries to the rescue!